The Main Sequence is where stars spend most of their lives. Main sequence stars like our sun have a hot, dense core where hydrogen is fused into helium. This heat is transported outwards toward the surface of the star through radiation and convection. There are a number of powerful forces acting on a star. Gravity pushes inwards, trying to collapse the star in on itself. The heat and radiation generated by the core pushes outward, trying to blast matter into space. Stars in the main sequence have achieved a state of equilibrium, which means that the forces pushing in and the forces pushing out are equal and balance each other out. 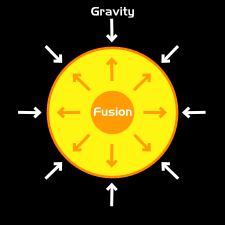 As long as the star has enough fuel in its core to continue its fusion reaction, the star will maintain equilibrium and stay a main sequence star. Most of the energy from a main sequence star is created by fusing hydrogen in a process known as the Proton-Proton Chain Reaction. This reaction takes hydrogen atoms, which have a single proton and combines them into helium atoms, which have two protons and two neutrons. This is a very complicated reaction, because it not only sticks protons together, it also has to change some of those protons into neutrons to make stable helium atoms. Positive and negative charges, however, don't just disappear. In particle physics, charges always have to add up. That means that if two protons go into a reaction with a +2 positive charge, the particles that come out have to have a charge that also adds up to +2. In the proton-proton chain, the extra charge comes out as a particle called a Positron. Positrons are tiny particles like electrons, but they have a positive charge, rather than a negative charge. Two protons collide, sticking together. One of the protons emits a positron (which carries off its positive charge), changing it into a neutron. This reaction also emits a neutrino, a small particle without a charge, which carries away much of the kinetic energy from the reaction. We now have a Deuterium atom, with one proton and one neutron. The Deuterium atom can then collide with another hydrogen atom, making a new atom with two protons and one neutron. This reaction emits a gamma ray, which is a highly charged photon. Our new atom has two protons and one neutron. Because it has two protons, it is technically a helium atom, helium-3. A stable helium atom, however, needs two neutrons, so our atom is going to react one more time. When two helium-3 atoms collide, we have a reaction with four protons and two neutrons. Two neutrons and two of the protons combine to make a new, stable helium-4 atom, while the other two protons go off to start new reactions within the star. This is just one of the many hydrogen burning reactions that occur within main sequence stars. However, the one thing that all of these reactions have in common is that they take hydrogen in and put helium out. For more information on these other reactions, see the Advanced Fusion page.